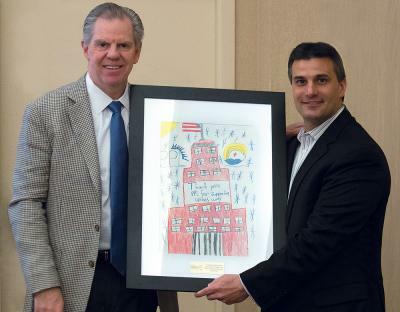 Bill Spence, CEO, presents Vince Sorgi, senior vice president and Chief Financial Officer at PPL Corporation, with a drawing from a Cleveland Elementary School student as a token of thanks for his leadership in the 2016 United Way Campaign. Note: The release has been updated to reflect total donations given throughout our 29-county service territory. Allentown, Pa. (Dec. 11, 2015) -- Employees and retirees of PPL Corporation raised nearly $1.4 million for the company’s 2016 United Way campaign. The donations will help residents in the 29 counties that PPL serves in Pennsylvania. Coupled with more than $610,000 in matching funds and other donations from the company, PPL, its employees and retirees donated more than $2 million total to the campaign. PPL Corporation goes beyond its core business by focusing its energy on being a good neighbor through a long-standing commitment to corporate citizenship. Since 2005, PPL Corporation has contributed more than $50 million to nonprofit organizations working to improve the quality of life for residents in central and eastern Pennsylvania. PPL is also a lead supporter of the nonprofit United Way in all the communities where it does business.